Make a self-donation and show your friends you're serious about raising funds to end Alzheimer's. THANKS FOR UPDATING YOUR PAGE! Update your personal fundraising page with a photo and story about why you're participating. YOUR EMAILS HAVE BEEN SENT! Ask your friends, co-workers and family members to join your team. Click here if you have already sent emails. Send fundraising emails, share on social media and ask others if they will support your efforts. New: Reach Your Goal Faster with Facebook! Go to My Page and personalize it by sharing why you're participating in the Walk to End Alzheimer's. Connect your page to Facebook and invite friends to donate. Thank your donors and track your progress. Donations through Facebook count toward your goal! Download some of our top fundraising resources. Want to become a top fundraiser? Collect all of our fundraising badges and you'll be well on your way. The badges you achieve will be displayed on your personal pages. Make a self-donation and show your friends you believe in a world without Alzheimer's. Well done! You are on your way. Thank you for making a self-donation and showing your friends you believe in a world without Alzheimer's. Tell your story, upload a photo and create a shortcut URL to share with friends and family. Great job! You've earned a badge. Your page has been updated. Next, share it with your friends and family and ask them to support you. Invite your friends, family, and coworkers to join your team or support your efforts. You are making a difference! Thanks for inviting others to support your efforts. Once you’ve received donations, be sure to follow up and thank your donors! To earn this badge, use our social tools to schedule posts. You can also get our mobile app. You've taken the next step! Thanks for getting social with your fundraising efforts. Send more social messages to boost your fundraising potential. To share your page using your personal e-mail account (in Gmail, Outlook, Yahoo, etc. ), write your message, paste in a link to your personal page and send to your contacts. Not sure what to write? Copy and paste one of the message templates provided below. I'm participating in the Alzheimer's Association Walk to End Alzheimer's® because I'm committed to raising awareness and funds for Alzheimer's care, support, and research. I'm leading the way to Alzheimer's first survivor — but I need your help! Will you help me reach my fundraising goal of by making a donation today? Visit my personal fundraising page to make a secure, tax-deductible donation or download and print the paper form on my page to mail in with a check. All donations benefit the Alzheimer's Association — and every dollar makes a difference in this fight. Together, we can end Alzheimer's disease! I'm participating in the Alzheimer's Association Walk to End Alzheimer's® and fundraising for a very important cause. Will you help me fight Alzheimer's by supporting my fundraising efforts? Your donation will help the Alzheimer's Association® continue to provide care and support to the more than 5 million Americans with Alzheimer's and their over 15 million caregivers. Your generosity will also help to advance research that will one day lead us to methods of prevention, treatment and, ultimately, a cure for the disease. Every dollar counts in this fight. Can I count on you? As a participant in the Alzheimer's Association Walk to End Alzheimer's®, I am leading the way to Alzheimer's first survivor — but I can't take on this disease alone. Will you join me in the fight by walking with me? As a team, we can be an unstoppable force against the nation's sixth-leading cause of death. Registration is easy; simply visit my Walk to End Alzheimer's participant page and join my team. If you're unable to participate, please consider making a $35 donation to my fundraising campaign. Every dollar advances the care, support and research efforts of the Alzheimer's Association®. Thank you so much for your donations to my fundraising efforts for the Alzheimer's Association Walk to End Alzheimer's®! Your generosity has helped me raise so far for the Alzheimer's Association®, but I'm not stopping there! Did you know that many employers will double or even triple charitable donations? Please check if your employer has a matching gift program at matchinggifts.com/walk. Every dollar raised advances the Association's care, support and research efforts — and the more we raise, the stronger our fight. To learn more about Alzheimer's disease or the Alzheimer's Association, please visit alz.org or call the 24/7 Helpline at 800.272.3900. Thank you for making a difference in the fight against Alzheimer's! Sending email through your Participant Center is an easy way to message your teammates and track who has opened your emails and visited your page. Dear [first name]" will be automatically added to the beginning of your message. If you'd prefer to add your own greeting, turn this off. Note: Click on a contact in the list above to edit an existing record. You do not have any saved drafts. You have not sent any messages yet. Click the "Customize Your Link" button to edit and personalize your Walk page link, then click "Save." Is your page public or private? Update your page below, then share your page on your favorite social network, via e-mail, or in a text message inviting others to support your fundraising efforts. NEW THIS YEAR! You can also turn your page into a Facebook Fundraiser, and leverage the power of Facebook to help you reach your goal. The donations you receive through Facebook will be reflected on your personal page and will count toward your fundraising goal. You've created your Facebook Fundraiser - good job! Visit your fundraiser. Select a photo of yourself and/or someone you are honoring. Make sure the details of your photo will be visible at 300 pixels wide (small image). You can use our inline photo editor to crop and add filters and stickers. Be sure to view your personal page after uploading your photo. WARNING: Do not copy/paste from MS Word. The formatting will carry over to this editor and cause unexpected results. You will have much better results if you copy/paste from a basic text editor, such as Notepad on Windows and TextEdit on Mac. A personalized video will be created on your behalf in the coming days, incorporating your name, goal, and the person or people you are honoring at the Walk to End Alzheimer's. You may update your goal and the name of the person or people you are honoring. is participating to honor __________. Examples: her granddad, Lou Smith, or Grandpa Lou. If left blank, it will say "all those facing Alzheimer&apos;s."
Click the "Customize Team Link" button to edit and personalize your Walk page link, then click "Save." Select a photo of your team and/or someone you are honoring. Be sure to view your team page after uploading your photo. Share your page with friends and family and let them know why you're participating in The Walk to End Alzheimer's. To change your team captains, simply check the boxes next to each person you want to be a captain, and uncheck those that should remain team members. Then click "Save Captains." Your team has no members yet. Use the forms below to join a new team or leave your current team. If you would like to start a new team, or if you need additional help with changing your team membership, please click the Help tab below and fill out the form, and a representative will help you with your request. If you need help with changing your team membership, please fill out the form, and a representative will help you with your request. Enter information into one or more of the inputs and then press the Search button. If you would like to leave your current team and partcipate as an individual, click the button below. Please provide the name of the team you'd like to join, and/or a link to the team page. Please provide details of the team you wish to create. Once submitted, a representative will process your request. Thank you for requesting to start a new team or join an existing team at the 2018 Walk to End Alzheimer's - Queens, NY. You will hear back from one of our representatives shortly. The dollars you raise for the Alzheimer’s Association will deliver critical care and support services while advancing research toward treatment, prevention and, ultimately, a cure. We’re here to help with tools, coaching and resources that can generate ideas and make fundraising easy! You are leading the way to a world without Alzheimer's! Use the tools below to grow your team and your fundraising success. This has everything you need to achieve your recruitment and fundraising goals. Keep your team motivated to meet fundraising goals with this poster. Edit your team's company/organization affiliation. Keep in contact with your team captains via email. View a list of all your team members, and optionally change team captains. View general gifts made to your team. Update the fundraising goal for your team as a group. Change the name of your team. Edit the fundraising page for your entire team, including photo and story. When you recruit team members, you multiply your impact in the fight against Alzheimer's. Use the resources below to build your team with friends, family, neighbors, community members and colleagues. These personalized cards make it easy for your supporters to find your team online. Print on sticker paper and post on walls as a fun, visual way to promote Walk. Let others know they can join your team with this customizable poster. Educate others about the Walk and why their participation is needed. Share the facts about Alzheimer's disease and help change the future. 10 tips for recruiting co-workers. Share this video with your friends and family and inspire them to walk with you. With creativity and planning, you can exceed your Walk fundraising goal. Use the resources below to get ideas and step-by-step guidance. Jumpstart your fundraising efforts with these simple steps. Need ideas? Host one of these fun events and raise funds. Partner with a local restaurant to boost your team’s fundraising. Organize a casual day at work where one can wear jeans if they donate to the cause. Learn how to plan a point-of-purchase Promise Flower fundraiser. Use this fun game board to drive your fundraising efforts. Get tips on a letter-writing campaign to reach a different audience of potential donors. Saying "thank you" for donations is easy with these printable postcards. Walk participants are raising funds to achieve our vision of a world without Alzheimer's disease. To receive credit for your cash and check donations, please fill out the contribution tracking form and turn them in on Walk Day, or mail them to our local office. Most donations require 2-4 weeks processing time before they appear in your personal page totals. You can also deposit checks immediately through our mobile app. Use this personalized form to collect offline donations. Keep track of cash and check donations with this form. Use this form to split up a large donation across multiple team members. It's our thank you to you! Check out the Walk to End Alzheimer's prizes available in recognition of your fundraising achievement! Earn rewards when you reach these fundraising milestones. Raise $500 to join our Champions Club or $1,000 to join the Grand Champions Club. Raise $100* and earn an official Walk to End Alzheimer's t-shirt. *Every registered participant will receive a T-Shirt after achieving the fundraising minimum established at their local chapter. In most instances, this is $100. Check with your local chapter to confirm their t-shirt minimum. Great job ! Here are your achievements. To earn this badge, join one of our many Walk committees. Download our iPhone or Android app to check your fundraising progress on the go from your phone or tablet. Print flyers, hang a goal-tracking poster, or get more ideas on how to promote your efforts. Download our offline donation form to turn in cash and check donations. Raise $500 or more join the elite ranks of the Champions Club. Raise $1,000 or more join the elite ranks of the Champions Club. Raise 10 donations in the fight against Alzheimer's. Raise 25 donations in the fight against Alzheimer's. Raise 50 donations in the fight against Alzheimer's. Raise 100 donations in the fight against Alzheimer's. On average, fundraisers who use social media raise 40 percent more than those who don't. Social media is a fun and easy way to share your passion for the cause and raise money to fight Alzheimer's. Not sure where to start? Read this guide for a rundown on how to share your team's story and boost donations via social media. Turn your page into a Facebook Fundraiser and invite friends to support your efforts for the Walk to End Alzheimer's. The donations you receive through Facebook will be reflected on your personal page and will count toward your fundraising goal. You can check your progress on the go, text friends and family, and deposit check donations immediately through the app. With a simple click, send friends and family directly to your Walk to End Alzheimer's page to read your story and support your team. Share this photo and tag your friends to spread the word about Walk to End Alzheimer's. A picture is worth a thousand words. Use these cover photos to show your friends and family you are in it until Alzheimer's is finished. Right click to save to your computer. Use our Twitter wallpaper to let fellow tweets know you are Walking to End Alzheimer's. You have not received any donations yet. Your team has not received any donations yet. View all contacts, teammates, and donors in your Contact List. The message has been copied to your clipboard. Now, simply go to your email editor of choice, create a new message, and paste this message into the email message. The sample post has been copied to your clipboard. Now, simply go to your social channel of choice, create a new post, and paste this sample into your feed. The text has been copied to your clipboard. Now, you can simply paste the text where you need it. The text has been selected. Now, simply copy the text by pressing Ctrl+C (PC) or Cmd+C (Mac) or tap and hold down on the text (iPhone/iPad) or press Copy (Android). You have been added to the queue to have a new video generated. Please allow up to 12 hours for your video to be updated on your personal page. You may need to clear cache to see the new version of the video. An error has occurred communicating with Facebook. Please try again. Your session has timed out. Please login to continue. Do you work in a Branch (FA/BOA) or Home Office/HBA? Are you FA or BOA? Are you sure you wish to delete this donation? This cannot be undone. Please send donations promptly to the Chapter office, making sure to convert cash to checks before mailing. Please indicate "cash converted to check" in the memo field. Contributions entered on this page will not count toward fundraising rewards until they have been received by the Alzheimer's Association. After the event, you may see that donations entered on this page will temporarily disappear while we process funds received on the day of the event. Funds will be re-credited as we complete our data processing. Please include the Walker Donation Information Form when submitting donations. The form is extremely helpful for us to assure we properly track your donations. Get to know the Participant Center with this quick guided tour. You can cancel out of the tour at any time, and start the tour again later. The Dashboard is the first screen you will see when logging in, and it provides access to the most important tools and resources available in the Participant Center. Not sure how to start fundraising? We have easy steps to guide you. Each item will be checked off the list once you complete it. Track your fundraising progress, update your goal, and access your full donor history. Quickly access our top participant resources. Don't miss out on the Get Social page! On My Page, you can create a custom URL, add a personal photo or video, and share your personal story. As a team captain, you also have access to edit your team page to share details on your team activity, location and any other pertinent details. Create a quick link that you can share with your friends and family. You can add a photo or video to your personal page to honor someone, tell a story, or just share a friendly smile. Update your fundraising page to let others know why you're participating in The Walk to End Alzheimer's, and what you'll be doing. Since you are a team captain, you also get a web page for your team. This page includes a roster and can be customized with a photo and details about how your team will participate in The Walk to End Alzheimer's. Here is where you send email, manage contacts, and track messages. These tools are here to help you personalize your messages and check who has opened the message and visited your page. Use your primary personal email account to send a message. Enter or select a contact, choose a sample message, personalize and hit the send button. Add new contacts or import them from another email service. See who donated and send a thank you message. Lost your work? Don't worry, we've got you covered. Did you accidentally close your browser or did your computer crash just before you hit the send button? Don't worry, we kept a recent copy for you here. Track who you sent messages to, when you sent them, and what you wrote. Click on a recipient or subject to get more details. Get step-by-step directions on how to fundraise with social media. Install the Facebook, iPhone/iPad, and Android apps to help you fundraise even further. Learn how to give your fundraising a boost with the ultimate social media playbook. 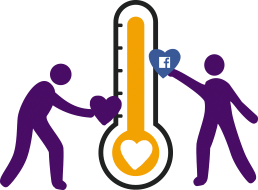 Create a Facebook Fundraiser and watch your donations grow even faster! The donations you receive through Facebook with be reflected on your personal page and vice versa. With our iOS and Android apps, you can fundraise, send emails, monitor your progress and edit your page from anywhere and at any time. Add images to your personal social media pages to spread the word about your Walk participation. Check how close you are to reaching your goal, download your donor information, and easily send thank you messages in the Donations section. Visit this page to see a list of all the donations you've received. Don't forget to thank your donors! Want to send good old fashion thank you letters in the mail? Download your donors' contact information below in a spreadsheet. As team captain, you can also view donations made on behalf of your team and send thank you messages. Note: This does not mean you can view donations made on behalf of individual team members. This list only includes gifts donated in the name of your team. Find all the top resources for fundraising and planning your activities for The Walk to End Alzheimer's. That concludes our self-guided tour of the Participant Center. If you ever need to start the tour again, simply click the "Take the Tour" button at the top. Thank you for supporting The Walk to End Alzheimer's efforts to end Alzheimer's. You must select at least one team member as a team captain. Every email you send brings us closer to a world without Alzheimer's. Are you sure you wish to delete this message? This cannot be undone. Are you sure you wish to delete ? This cannot be undone. Note: When uploading a .CSV file, you must provide three columns : First Name, Last Name, and Email Address. Your contacts were successfully retrieved. Import all or some of the retrieved contacts into your Participant Center Address Book. Your contacts were successfully retrieved. Upload all or some of the retrieved contacts into your Participant Center Address Book. Photos must be in .jpg format. The maximum acceptable file size is 4MB. Or use our photo editor. Are you sure you wish to delete this photo? This cannot be undone. Your video is saved. Please use a device that supports Adobe Flash to preview it. is participating to honor ______. TURN EVERY EMAIL INTO A DONATION OPPORTUNITY! With our email badge, every email you send will update your recipients with your fundraising progress, and serve as a donation opportunity, right in your email signature!